An experienced commercial litigation solicitor with expertise in professional negligence claims. Articulate, charming and focused. Has an instinctive understanding of client needs and is solution oriented. Karishma has a considerate and understanding approach, which instils confidence in those with whom she works. Her analytical skills are impressive, yet she also demonstrates great creativity in her thinking which makes for a powerful combination. Karishma is eloquent and delivers her thoughts in a structured and well-reasoned way. Being focused and goal orientated, she uses her energy to quickly move discussions along to hone in on exploring potential solutions with parties. WHY CHOOSE KARISHMA AS YOUR MEDIATOR? 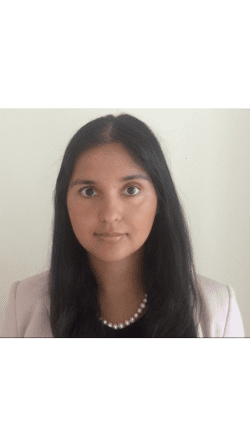 Experienced litigation solicitor – Over 9 years’ experience working in the city, Karishma is a skilled negotiator and her extensive legal experience has shown her that almost any dispute can be resolved through mediation. Commitment to finding a solution – If, exceptionally, a settlement is not achieved on the day of the mediation, Karishma will work with the parties to try and achieve resolution in the days following the mediation so that the momentum towards settlement is not lost. All types of civil and commercial dispute. Specialist expertise in professional negligence claims. Defence of professional commercial disputes, including acting on behalf of solicitors, surveyors, schools, universities, insurance brokers, charities, magazine publishers, trade unions and GPs.